To get to know more click 'Mehr lesen'. Did you already see this? So you want to join in on something like that? Great! What? You're lacking ideas, you say? Well, if you want to be a part of something big, something grand but still don’t have a clue what you could do to participate then let us help you. We also have ideas which are easy to do without embarrassing yourself, though that's always welcome. (Yeah, some members of TJI did that already, and often enough, too! Do we need to remind you? Exhibit a) Giving Hahe the shirt right off our back, or exhibit b) rapping our soles out of our body.) So now it is your turn! We've received an email from Eyelesstress, a reader of this site, and she suggested a really simple idea. Check it out. 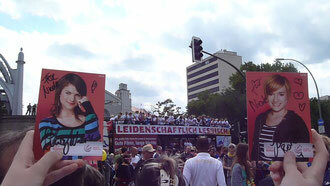 I thought it was really funny that 'Jenny' and 'Emma' (the autograph cards) went to a world cup match and to Pride. I'm still in London so I thought I might take them to Buckingham Palace, Big Ben etc. 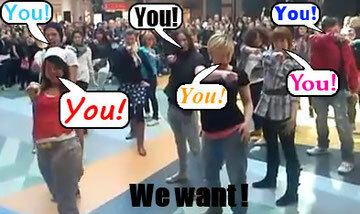 for the flashmob video. I've tried to take a screenshot of the photos to print out but I can't get a good enough picture. If anyone can get a copy of the pics to me then I'll take 'Jenny' and 'Emma' into London and get some photos of them to send to you! Maybe [more people could do the same and do pictures of them at] iconic places or events to show the worldwide appeal of Jemma? You wanna see how it will looks like? Here are two examples! Can you read the sign on the truck? You think it's coincidence? We think it's DESTINY! KARMA! Everybody knows Ellen DeGeneres. Right? Right! She had this crazy idea of seeing her face all over the world. And? It worked out perfectly. No, wait! You don't have to print out Ellen. YOU can choose between Jenny, Emma or even both. So click on the Pics and they will lead you to the download link. Print the girls out and follow the instructions like above. Or when you got a talent for craft make flags or even masks of it! For more information and teasers go to the original Virtual Flashmob page. So will you participate? Or did you already? Having some problems? I need 2 more hours!!! past the deadline! :( i'm so sad that I am a procrastinator! am i missing the video somewhere?